From Goodreads ~ Providence, Rhode Island, 2017. When doctoral student Cameron Coelho, 28, opens a package from Indiana, he finds more than private papers that will help him with his dissertation. He finds a photograph of a beautiful society editor murdered in 1925 and clues to a century-old mystery. Within days, he meets Geoffrey Bell, the "time-travel professor," and begins an unlikely journey through the Roaring Twenties. 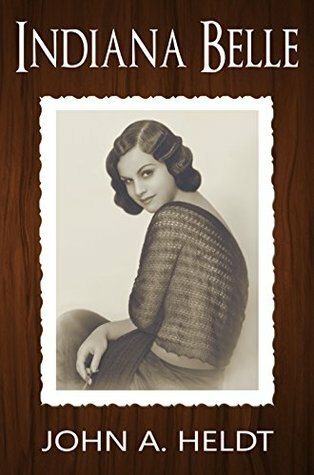 Filled with history, romance, and intrigue, "Indiana Belle" follows a lonely soul on the adventure of a lifetime as he searches for love and answers in the age of Prohibition, flappers and jazz. It's February 2017 and Cameron Coelho is a doctoral student in history writing a dissertation on the social norms and cultural dynamics of Middle America in the Roaring Twenties. He buys some private papers of Candice Bell, who was a reporter for an Indiana newspaper in the 1920s, which include personal letters, business correspondence, notes from interviews, pages torn from a diary and a picture. He is provided with the opportunity to travel back to 1925 to meet Miss Bell. He is forbidden to change events that happened which includes the murder of Miss Bell that summer. This is the seventh book I've read by this author and I liked it. I like time travel books when people go back in time. Though it is part of the American Journey series, you don't have to read the others to know what's going on since the only constant is the person who is able to send people back in time. The author wrote about 1925 well and I got a good sense of what it was like living in that time period ... you had to speakeasies for liquor, the KKK was strong, etc. It is written in third person perspective with the focus shifting between Cameron and Candice.